Give Simple is a gift website that has the policy of stocking simple but meaningful gifts. They seem to be catered for Moms but that might be because of the coming Mother’s Day. But their gifts are definitely targeted for women and the women in your lives. An example of the items they carry are these Peacelovemom T-shirts. They look so soft and comfortable and make wonderful gifts for your mom or yourself or your wife if she’s a mom! They retail for $38 for the short sleeved T-shirts and $49 for the long sleeved ones. I would love to get them but unfortunately I’m not a Mom! I particularly love these little vases. Inspired by milk bottles, they are a plain white with a little image on them and the words “Love”, “Mom”, “Thank You”, “Best Friends”, “Happily”and “Baby”. They are so adorable! I can just picture them on my dining table or display cabinet with some flowers in them. Anyone who receives these as a gift would be so touched. Its the simple little design that tells you the person who bought it thought of you. Nothing flashy or gaudy butÂ just a simple heart-felt message on it. I love it! They are sold for $25 each. There are many other categories available on Give Simple that you can browse through. Many are quite unique in my view. One category I enjoyed looking through was the Gift Packages category. They have packaged some items into useful and lovely sets that you can just buy without having to crack your head thinking about them. One I liked was Say it with Chocolate. If the person you plan to give a gift to is a chocoholic (and really which woman doesn’t love chocolate?) here’s the perfect gift without the calorie guilt. 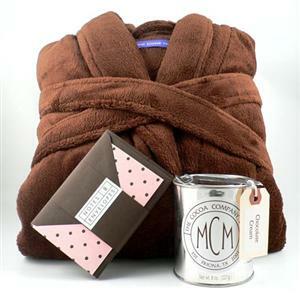 You get their best-selling, super-soft chocolate robe, hot cocoa in a clever silver paint can, and a set of trendy pink-and-brown polka dot stationery. It retails for $93. The gift packaging is simple but feminine. Not every woman likes flowers all over so they have kept their colours a soothing pastel. The packaging is a white box with an apple green ribbon around it and colourful tissue paper inside. Elegant. They presently ship only within the USA and shipping is free for purchases above $75. Exclusive for you, my readers, from now till May 31, 2007, you are entitled to get 10% off your order if you use the code WOMENSTUFF at checkout! Unfortunately, as I’m based outside of the USA I have no way to order any of the items. But if you are ordering, don’t forget your code! I don’t get any payment for this, but you get a great discount. Mother’s Day is coming so go nuts! Enjoy! Oh.. love those vases.. so cute. Thanks for sharing. I’ll check out the site!